Social aspect of job seeking — A.M. The aim of my thesis was to explore this rising domain of social aspect of jobseeking. The focus of the project was to find opportunities for Naukri.com in this context. The project initiates with understanding of the domain of jobs as a whole followed by further understanding of people’s social interaction, networks and communication tools (both online and offline) which help them seek jobs. 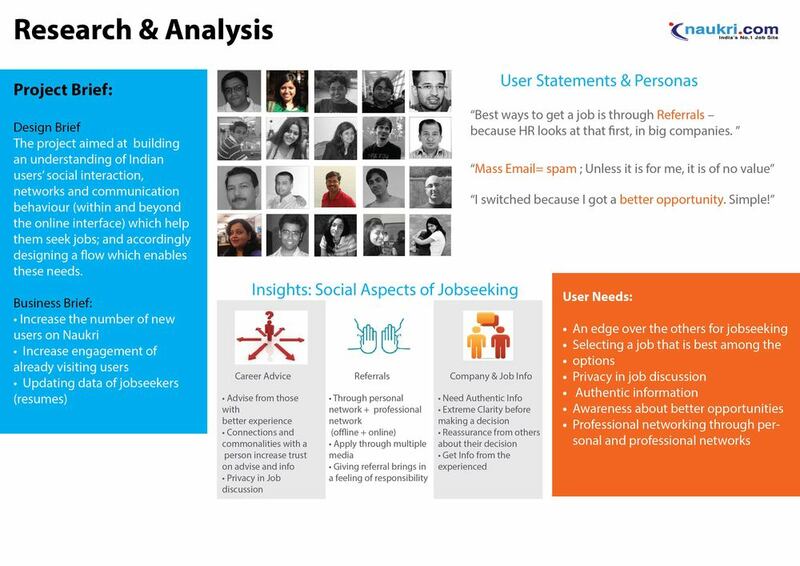 A detailed user research to understand communication behaviour of jobseekers (freshers, mid level and senior level) gives real world insights about the role of technology and people in jobseeking. The project concludes with the flow of the design that displays a part of the possible implementation of the concept. Also suggested is an implementation plan for the concept to be successful. It is evident from this project that jobseeking and recruitment as a domain can benefit from social media to a huge extent, and thus add value to the existing job search sites.